according to the inventory of 1763, the Cathedral stone, five-domed, in the name of all Saints (now the Resurrection of the worshiper), about one throne, with a porch and two tents. Its roof was covered with planks,and the heads with tinted tin. In the four-belted altar iconostasis of the image it was decorated with silver crowns and Rizas, and some with pearls and precious stones. In 1792, the Church of all Saints was demolished. 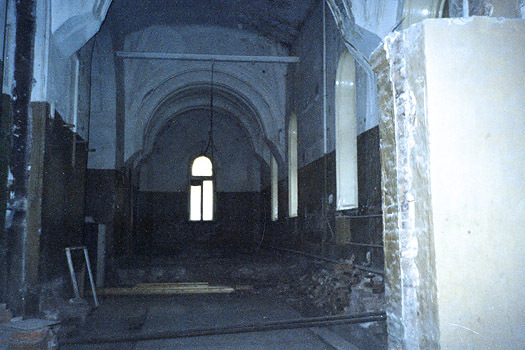 In the middle of the monastery, the one-headed stone Church in honor of all Saints, built by the Moscow merchant Diomid Meshchaninov, was consecrated by the Moscow Metropolitan Plato, and its chapels: in memory of the renewal of the Church of the Resurrection of Christ and the Tikhvin Mother of God were consecrated in 1772. In 1814 and 1815, Archbishop Augustine consecrated the restored churches in memory of all the Saints, which is now the word of the Resurrection and the Tikhvin Mother of God. The Cathedral Church was cramped; then the skilled architect M. D. Bykovsky in 1853. built extensive about five domes, which contains a part of the old, later dismantled: in the middle of it, under the dome were the same four pillars or pylons connected by arches, as well as the Eastern wall of the main altar. To middle big dome attached four omegranate side with heads covered with white tin and topped with vitroceramic crosses. Around the middle of the tribune under the arches of the temple placed the sacristy, lighted by the Windows of the side domes. Slender and majestic this building is in the Romanesque style, suitable to the Greek; the ornaments of its outer walls, Windows, doors and domes in the taste of the same style. The inside of the Cathedral corresponds to the exterior. From the main temple, or the so-called ship, under the dome of the podium separated by light arches on the pillars of the two side of the throne. In the middle part of the throne in honor of the Resurrection of Christ, North, in the name of the Tikhvin Mother of God, South, in memory of the Holy Martyr Alexandra, celebrated on November 6. Three parts of the temple, three of its branches, three thrones and three entrances Express its symbolic Trinity. The space in the temple is connected with its full illumination from the wall Windows and the tribune, with a variety of parts, the harmonic unity of the whole, which manifests the idea of the temple. Placed on the Solea three-stage iconostasis of the main altar and side altars thrones decorated with elaborate carving and rich gilding; the image in them of the ancient Greek style of the old iconostasis, others re-written in the manner dago harmony. Of these, especially remarkable is the luxuriously decorated ancient and venerable icon of the Tikhvin Mother of God. The main altar, although not extensive, is distinguished by its splendor, its iconostasis in five tiers. Arch over the throne in the form of a canopy resting on six pillars, the marble, which with the other hand separates the southern and Northern predatory. On the walls and vaults of the altar of the temple and the meal of the impersonated acts of the earthly life of the Savior and the faces of the Saints painted by the experienced Artery, Myagkov and Telescope. In decent places corresponding sayings of St. The Scriptures inscribed in Church Slavonic calligrapher by Leontius Lepeshkina. To lengthy and light meals adjacent domestically porch of the temple. 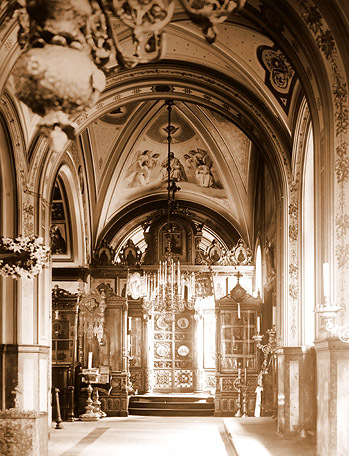 in 1929, a decree was issued to close the monastery. After 66 years of devastation and desolation in 1995, with the blessing of his Holiness Patriarch Alexy II of Moscow and all Russia, the intercession convent of the stauropigion was renewed here with the appointment of the abbess of the monastery of the nun Theophany (Miskina). on April 4, 1998, his Holiness Patriarch Alexy II of Moscow and all Russia made the great consecration of the crosses of the Church of the Resurrection. on November 22, 2001, the three chapels of the Church of the Resurrection of the word were fully consecrated on the day of the 120th anniversary of the blessed old man Matrona. His Holiness Patriarch Alexy II of Moscow and all Russia made the great consecration.